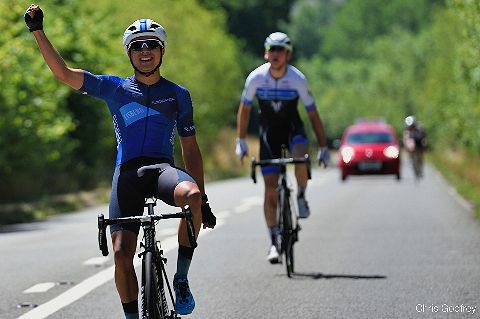 Kibosh Racing hosted its 2nd annual road race in Hatherleigh, Devon. The course tackles the grippy but fast Jacobstow circuit, finishing at the top of the climb on the Hatherleigh by-pass. A strong, mixed field of elites to 3rd cats rolled out at 10am with the temperature increasing and what would prove to be an attritional race. Max Stedman (Canyon Eisberg) instigated the break on the first lap attacking over the first climb, taking a large group of strong riders with in. This move proved decisive with teams members of Team Tor and Tri Uk represented in both initial groups. As the race went on, attacks from the front group and attempts to bridge from the bunch split the field further. Max lead coming off the main circuit and finished off the move by winning the uphill sprint from Will Bjergfelt (2nd)(Team Tor 2000) and Lee Frost (3rd)(Team Tor). Joe Healy was first 3rd cat across the line and 16th overall. Team Tor narrowly won the team competition from Tri UK with 3 riders in the top 15. The team would like to thank the volunteering of commissaires, accredited marshals and NEGS for their time as without them a small race team would not be able to host such a race. Also for the support of Sponsors; Rapha, Fabric, Four Pure Brewery and Allpress, for providing prizes and the best coffee.